Take a coffee or a meal on the terrace you will enjoy a special moment in the calm and serenity. 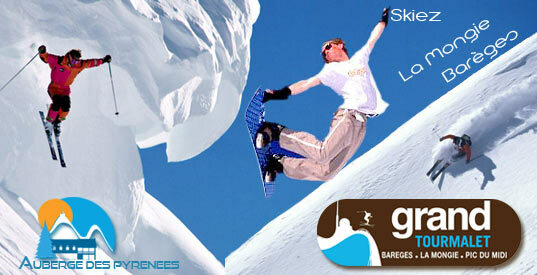 For holidays of successful winter sports, skiing and think La Mongie - Barèges. Relax and enjoy the show along with our Mounaque Pastourelle. Each year the shepherds and their flocks rendezvous in the mountain pastures. The Mill of Mendagne is since 1807 the Napoleonic cadastre, restored in 2006 for the bonnheur of all, it is one of our last vestiges of the past. As a Giant, Pic du Midi de Bigorre dominates our valley. Idéally situated at foot of the Pic du Midi de Bigorre and the mythycal passes of Tourmalet and Aspin, this Hotel will delight both amateurs and confirmed cyclists alike. Each year we are priveleged to have the Tour de France pass directly in the front of our hotel . Hardly a kilometre from the famous forge at which the rider Eugène Christophe, in his time, repaired the fork of his bicycle and so was able to continue on his course to reach the Tourmalet pass, The Auberge offers a whole host of itineraries in the heart of the Pyrenees. In summer as in winter, the Auberge is the departure point numerosus rambles to relieve the stress of daily life in a natural and restful environment. In the heart of the Grand Sites Pyrénéens, Pic du midi de Bigorre, Pont d’Espagne, cirque de Gavarnie, Cauterets et Lourdes, Sainte Marie de Campan is the central axis for all these special destinations to be found in our départment of Hautes-Pyrénées.